Long in preparation, Observations on Local Education, his seventeenth Project, emerged in 1988 at the painter's Barbican studio. 92 of the works had been previewed between 19 July - 3 August at Chilford Hall Barns, Linton during the 1987 Cambridge Festival. 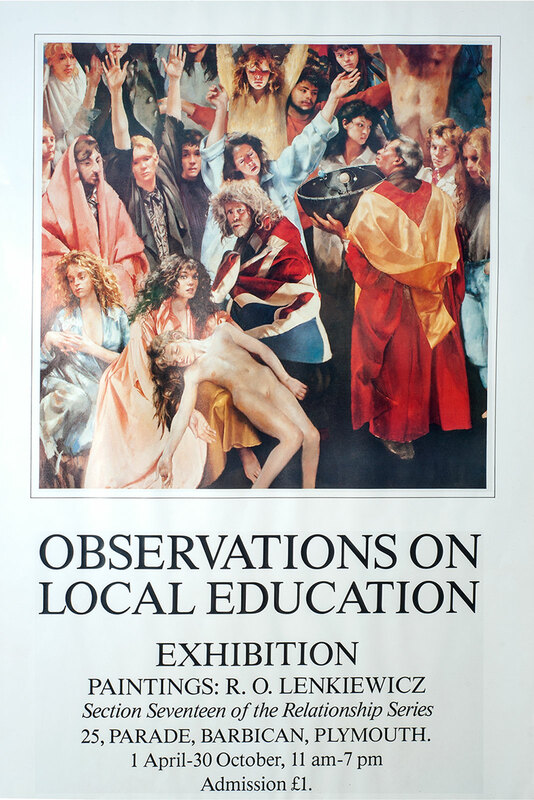 Two large volumes of observations written by his sitters, including local teachers and headmasters, schoolchildren, and radical British educationalists such as Dora Russell and Michael Duane, were published. These books, and the drab likenesses of uninspired education professionals, were intended to serve as evidence that British schooling in the 80s had succumbed entirely to an “education for work policy” even as it congratulated itself on having incorporated the best practices of the child-centred learning revolution of the 1960s and 1970s. The young person’s sensitivity to example is immeasurable. A parent or mentor whose creative life is passionless, dulled and uninspired, will have grave difficulty in valuing themselves ... We do not value another person by feeling superior or inferior to them. That is the straight road to fascism. That we may mean the young harm is a very unattractive thought, but refutation is tenuous when we observe our schooling procedures. The mass commercialising of the young, with its ensuing brutalised sensitivities, now operate so collectively and with such grand-scale obeisance, that in the far future we may reflect upon present day educational policy with the discomfort normally allocated for the Holocaust. “about the mass spiritual slaughter of the young on a huge scale”. I barely recollect a moment’s depression in my life and I am certainly of an optimistic nature. The Projects that I work on are academic surveys of aspects of human behaviour. They attempt to assimilate information impartially. Of the 17 large Projects I have worked on in recent years, this one on the theme of Education has been the least salutary and the most sinister and depressing. Please refer to the formatted list shown in the Exhibition List PDF.